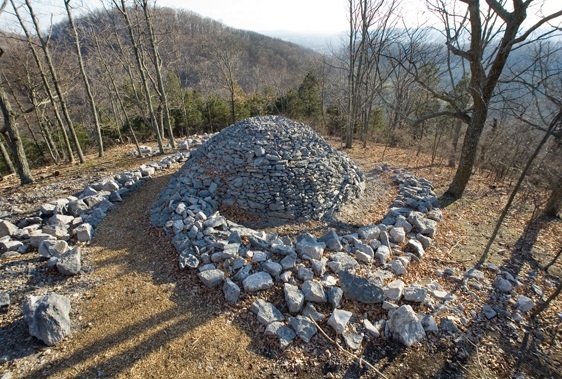 The Star Chamber is a land sculpture conceived by artist Chris Drury. With the help of Dyer Observatory staff and many generous volunteers, the construction of the Star Chamber was completed over 29 days during October 2006. Over 200 tons of native limestone from a construction project on the Vanderbilt University campus were donated and hauled to Dyer. The notched logs forming the interior room are from the Star Chamber site itself. There are no nails or spikes holding it together. The outer rock arms are meant to represent the spiral arms of a galaxy, and the chamber itself forms the central galactic bulge. After entering the chamber, give yourself several minutes for your eyes to adapt to the darkness. After a minute or two you will begin to see shapes on the walls that will gradually become more visible as your eyes become more dark-adapted. 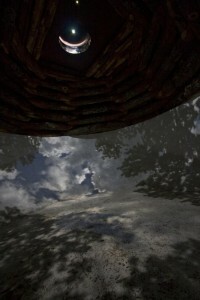 The sky and horizon will be projected around the chamber as light enters the quarter-size hole in the center of the ceiling. The Star Chamber is a camera-obscura, otherwise known as a pinhole camera. The images projected by the small hole are upside-down and backwards, just as images are formed by telescopes and your own eyes! A view from inside the Star Chamber on a cloudy summer day. A second hole drilled in the top plate, visible from interior of the chamber, allows a spot of light to be projected on the inner wall (opposite the entrance) and floor around noon each day. By marking this spot precisely at noon (or 1pm during Daylight Savings Time), the chamber becomes a sundial. The spot will trace out the shape of a Figure-8, known as an analemma, over the course of a year. This shape results from Earth’s axial tilt and changing orbital velocity. If you look along the northern inner wall, you will notice small brass pins that have been embedded in the concrete – these mark dates that observations were made. In addition, keep in mind that even the analemma is projected upside-down, which will cause the summer solstice position to be at the bottom of the analemma (on the floor) and the winter solstice position to be near the top of the analemma (near the top of the wall). This is presently the only such installation of a camera-obscura and sundial in the world. Combined with the solstice and equinox stones that are located just to the north of the Star Chamber, one can gauge the season and time of year just as ancient peoples did. The Solstice and Equinox Rising Stones. The corresponding setting stones would be behind the observer. As you near the sculpture you will see several upright stones. These stones are used to determine the rising and setting positions of the Sun on the solstices and equinoxes. Site from the center alignment stone over the tops of the eastern rising stones (to your left if you face the Star Chamber) or the tops of the western setting stones (to your right if you face the Star Chamber). The points marked by the northernmost rising and setting stones show the where the Sun will rise and set on the first day of summer, otherwise known as the summer solstice. The points marked by the southernmost rising and setting stones show the where the Sun will rise and set on the first day of winter, which is known as the winter solstice. And the points indicated by the middle stones, which mark due east and west, signify where the Sun will rise and set on both the vernal and autumnal equinoxes, the first days of spring and fall, respectively. The orbit of the Earth around the Sun as viewed from above. The solstice stones are set about 47° apart, which is how far the Sun’s rising and setting positions vary over the course of six months as we go from one solstice to another. This change in position is due to Earth’s tilt of 23.5° (23.5° + 23.5° = 47°). If Earth were straight up and down on its axis as it orbited the Sun, the Sun’s rising and setting position would be due east and west, the Sun would reach the same altitude at noon throughout the year, and we would not experience seasonal changes. Contrary to popular belief, our seasons are NOT caused by our changing distance from the Sun. 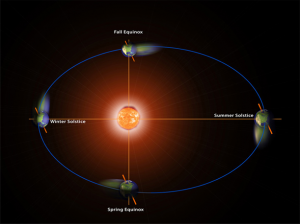 While it is true that Earth does vary in distance from the Sun by about three million miles over the course of the year, Earth is actually closest to the Sun while the northern hemisphere experiences winter. If you are interested in visiting the Star Chamber, then you can find more information here on how to arrange a grounds visit. Due to the volume of public and private events, visits to Vanderbilt Dyer Observatory are available by appointment only. Public event dates and times are listed on our calendar, and we are also available for school field trips or community tours with reservations. Before planning a visit, please call us at 615-373-4897 or contact us here.